The Great Gatsby has had a huge influence on our life. We watched it on our 3rd date and it was a large part of our wedding theme. We even went as far as having our flowers made out of pages of The Great Gatsby. So when we heard that Amazon Video was going to be doing a mini-series about F. Scott Fitzgerald’s wife Zelda (who was also a writer and the inspiration for a lot of his works), we were beyond excited. 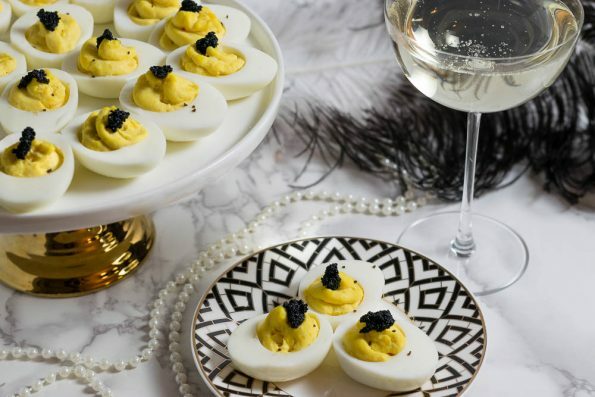 We decided to focus on deviled eggs, a recipe that was popular in the 1920s and give them the opulent flair you’d expect to see at one of Jay Gatsby’s parties. That was the beginning of our West Egg Deviled Eggs. We researched as much as we could about 1920s parties and the types of food that would be served in speakeasies. The overwhelming conclusion was finger foods. Tea sandwiches, deviled eggs, and the like were all the rage. They were easy to prepare and eat. Hors D’oeurves were often plentiful to help balance out all of the drinking they were doing. The West Egg Deviled Eggs are heavily inspired by something we felt you’d see at a Jay Gatsby party. A bit over the top and opulent. West Egg, after all, was new money. Topped with caviar and truffle salt, the West Egg Deviled Eggs are decadent and delicious. They are perfect for a viewing party of Z: The Beginning of Everything, a Gatsby inspired party, or even a regular party that you want to take to the next level. We hope you enjoy them! Cut eggs in half, separating the yolks from the whites. In a bowl, combine egg yolks, mayo, and mustard. Once combined, place egg yolk mixture into a piping bag. Pipe yolk into reserved egg whites. It is best to hard boil your eggs 1-2 days in advance and refrigerate them. This will make them easier to peel. Oh wow, these sound delicious and indulgent! Perfect for special occasions! great twist to a classic! I love these things so much! They look delicious and I would love to try your recipe! Also, what kinda camera do you use, those are some great photos? We use a Nikon D3300. Totally worth getting! We love it! Truffled salt and caviar surely bring those deviled eggs to another level!! Love the extra mustard touch also. Great post! The shots are gorgeous. I like the fact, how you have incorporated yellow into black and white. Love it. Well this certainly takes the humble deviled egg to a whole other level. I have yet to try caviar, but I do use truffle salt. As for the Great Gatsby….I loved the Robert Redford version. I grew up on a farm and we always had chickens. So, needless to say, I’ve made my fair share of deviled eggs in my lifetime! I love how you’ve taken a typically “unsophisticated” food and made it uber-delectable. The combination of caviar and truffle salt with plain old deviled eggs sounds absolutely amazing! Now I just need to throw a party to make them for, and no, sadly I don’t think they’d be appreciated at the upcoming Super Bowl party lol. Thanks for a great recipe! I am an Egg fanatic so everything eggy is automatically a favorite and deviled eggs are such a classic in any and all avatars. These look mighty delicious. How lovely to have a Great Gatsby wedding theme. 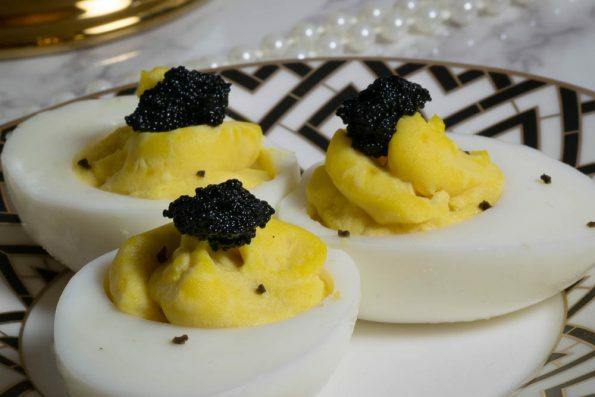 Your devilled eggs are so extravagant with caviar and truffle salt, perfect for a Gatsby inspired party. First off, I can only imagine how cute those flowers were made out of the pages of the book. It definitely was a unique touch and I’m sure wow’d your guests. Secondly, I had no idea that deviled eggs were so popular in the 20’s. Fascinating!!! Thirdly, I’m loving the little elegant touches you added to these beauties. Deviled eggs are my favorite. I’ve never thought to garnish with caviar. I definitely need to try this out. Thanks for sharing!